Gene Autry about done in with features, traveling and television by now preferred modes for peddling merchandise that was his personality and song. We see paunch developing --- if earned millions won't permit a good steak and bottle, what's the point? Note increasing role of Smiley Burnette in these later Genes ... was the sidekick so often singing a welcome thing? May-be it was contractual condition of Burnette participating, or perhaps Autry liked time off that Smiley at center stage allowed. Some will say that GA on TV was actually faster and more satisfying than his movie stuff. I've not done enough comparing to say. The features had been produced by Autry since soon after the war and released by Columbia. He'd do them handsome enough to rise above fray of other B westerners --- points of pride, I guess --- but the Autrys aren't necessarily better than westerns on fade at Republic, where Rex Allen was pulling last round-ups. On Top Of Old Smoky was wrapped for a song, literally ($50,201.52 according to Boyd Magers' excellent Autry book), and figuratively (the title tune another hit that sold platters and sheets). Villainy is obscure here; just street bullies for Gene to conk out. Too bad I was born too late to see these things theatrically. 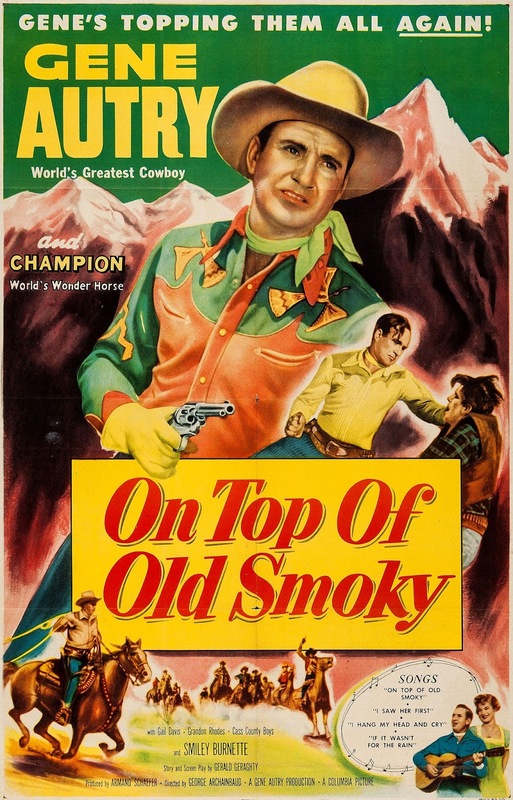 On Top Of Old Smoky has played on Retro HD, a big enhancement to an already well-preserved title. How to pick from so many film books taking the stage these days? Some choose based on genre. 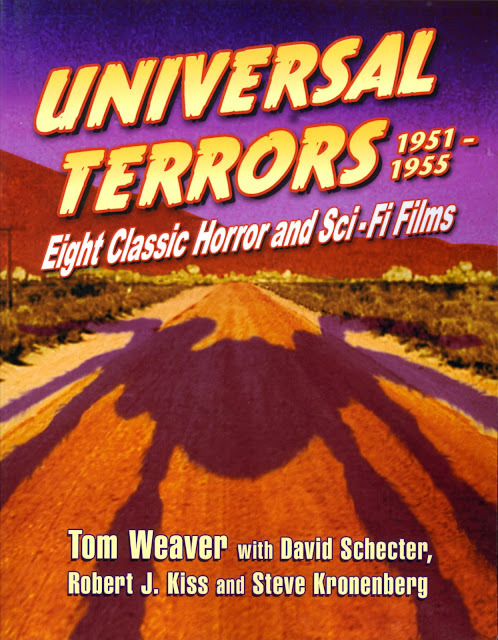 Where you've lifelong-loved Universal sci-fi and horror, then Tom Weaver and company's latest, Universal Terrors, 1951-1955 comes as natural choice. Reason aplenty to order is Weaver's imprinteur, for even if one cares less of subject matter, this writer is stylist enough to spin prose web for all us unwary flies, whatever past exposure to the eight chiller-thriller-dillers profiled here. "Profiled" may be too slight a term, for these are detail studies to put all past coverage in permanent shade. But Universal Terrors is more than recital of movie makings, for here is deep dug account of 50's process at a filmland address lots find a most magnetic, monsters plopped before cameras less fearsome than ego-fiends sucking blood off rivals in writing, make-up, music, acting, all of what earned paychecks and set studio hornets to one another's neck. Many if not most lived long enough to be interviewed by Tom Weaver, each articulate as to who done wrong to whom. For thrust of knife to backs where they belonged, Universal Terrors has no peer in print. Thirty-forty years was none too late for getting even, it seems, and these Uni vets down to a last had memories long and forgiveness short where knavery among co-workers was recalled. Much of Universal Terrors is He said --- No, I say --- debate of dirty trix by hustle-artists busy sawing rungs behind as they climbed ruthlessly up. Was it for money, power, the satisfaction of screenplay credit on Tarantula? So much reminded me of vendettas kept, indeed harbored, by humbler of we civilians who suffered slights from mean boys or girls at work or school, except here were richer chips Uni vipers played at, at least it seemed so back when monsters meant money. Weaver and co-writer Robert J. Kiss wisely point out that keeping budgets slim allowed weirdies to cash out nicely. It wasn't for charity to us fans that Universal kept doing these things. Detail of all that is where Universal Terrors shines brightest. Imagine for purpose of this book that beloved pics (the eight plus copious reference to others) are Aurora models built by Weaver and team. No production piece goes missing, all adhere nicely, with behind-scenes so You Are There that I'd almost swear to working on The Strange Door, It Came From Outer Space, or one/other Creature feature. In event of reincarnation, let it be to soundstage of any of these eight, for thanks to Weaver work, I'll surely know my way around. I believe more fans sprung off the old horror movies on TV than ever came when they were new. Viewership was many times greater now that we could see monsters for free rather than on paying basis. Another thing was films being comparable, or better, than new chillers coming out in the 50's and 60's. King Kong was still cutting edge from FX standpoint forty years after it opened, and no gothic had surpassed the original Frankenstein, even after Hammer Films threw paint on the story. When was it ever so cool to like twenty/thirty year old films? (Our Gang maybe ... but look what's become of them) Kids could even respect their parents for growing up in an era when this stuff came out. I remember an episode of Leave It To Beaver when Ward bonded with his boys for seeing Dracula "four times" during youth, and having a subscription to Weird Tales magazine. It seemed that monsters were an enthusiasm that dad and offspring could share, right from mid-fifties when oldies oozed onto late nights. The Universals wouldn't land until fall 1957, but appetite was keen and channels satisfied it with whatever of the genre could be got. From a broadcasting start, that meant cheapies from Monogram, PRC, or others of independent origin. A lot of Bela Lugosi got into viewer consciousness this way. 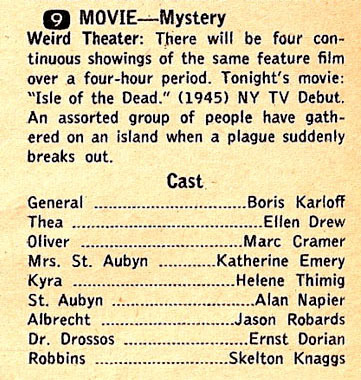 Preview of waves to come was 1956 release of RKO's library to syndication. 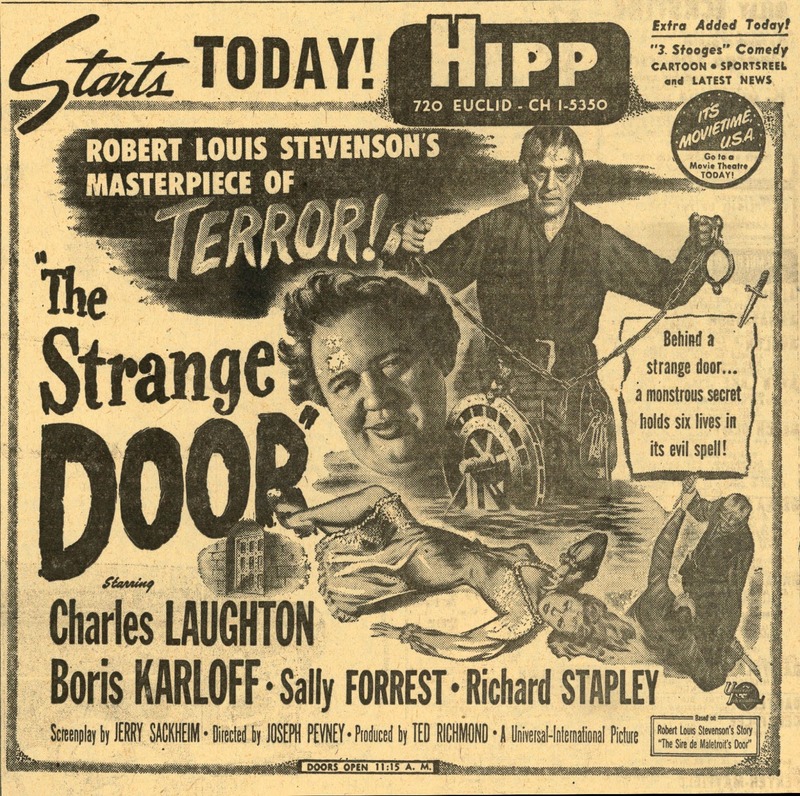 They had the Val Lewton thrillers plus a few odd/ends that could be called horror, or at least "weird," so on came WOR's "Weird Theatre" to New York airwaves, making do with what monsters could be had before Universal-Screen Gems let loose the "Shock" package a following year. 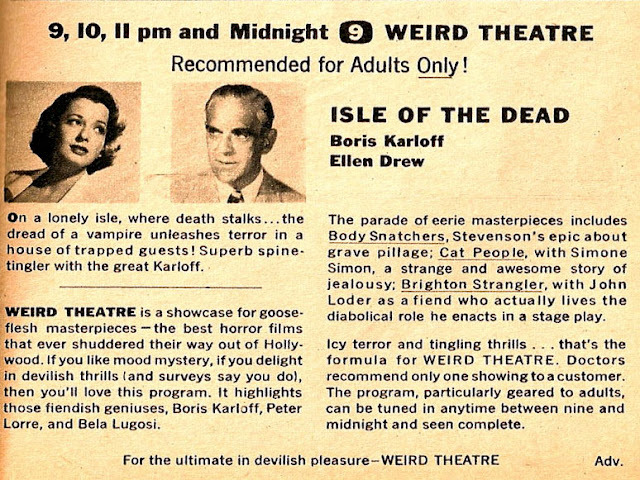 We could say on one hand that folks at-home had it made, what with The Body Snatcher plus Isle Of The Dead on primetime, and gratis, but here was rub: Both pics ran four times in succession over a four hour period, a "devilish pleasure" tempered by necessity of cuts, and deep ones, in order to begin and end within 60 minutes. The Body Snatcher was a 77 minute show, while Isle Of The Dead ran 71 minutes. With commercials, as many as WOR could sell and keep their broadcast license, these classics might have been shorn by a fourth, if not more. Still, it was names and freshness of product that beckoned, and what did home sitters care whether all of original content was there? Lifelong fans of Lewton would make discovery on these nights, some celebrating him in books and documentary tribute to come. Television meanwhile became sole avenue for monster sighting, at least monsters of early vintage. 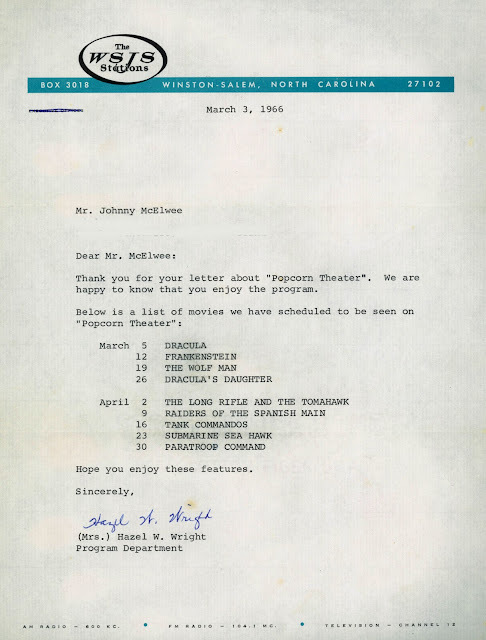 The Universal drop was welcome, but in most instance, only one station in a viewing market had them, unless there was package split, like we had in Winston-Salem/Greensboro/High Point, where three channels serviced that area's broadcast reach. Two of those used the "Shock" titles, and fans were quick in coming to know which had which of favorites. Any Universal horror on TV was precious ore. Whenever one came on, you watched, lest that be last chance. Channel 12 in Winston-Salem had the best of the group, most of Frankensteins, Draculas, Mummies, plus The Black Cat and The Raven. They even played them on Saturday afternoons, often without commercial interruption, such presumed dead time that no sponsor could be interested. I wrote them often for titles and to make programming suggestions. Replies like the March 1966 above put me by way of classified info that trumped even TV Guide for advance notice. 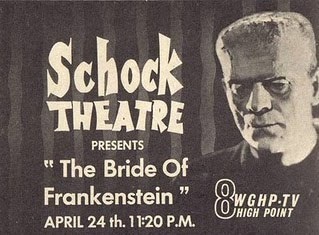 High Point's Channel 8 counter-programmed with the "Son Of Shock" package, less titles and the best ones absent, but they did have Bride Of Frankenstein, per ad at left, which made keeping up with the station's "Shock Theatre" on Saturday night an imperative. Following local stations and their horror usage was applied science. We never thought there was enough. Looking back, I recognize bounty of this stuff, which along with what the Liberty had on Saturdays, made each weekend a surfeit of riches. I'd see five or six chiller/sci-fi's on flush days and nights between school out on Friday and return on Monday. 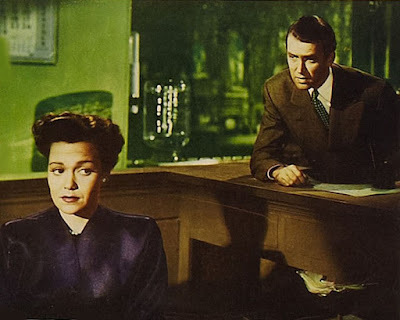 A then-equivalent to binge viewing, but frugal beside marathons TCM routinely offers. Given access to latter in the mid-60's, I'd have gone mad by sheer rapture of it. Thanks to Scott MacQueen for supplying me with all of ads above. 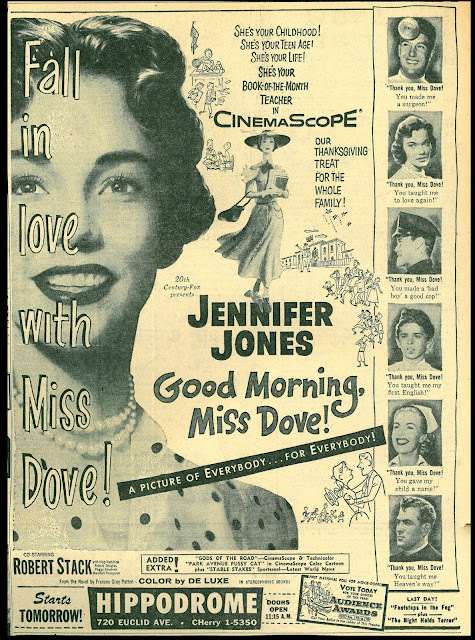 Where survey was taken of "beloved" movies, and magazines/newspapers used to do these from time to time, sort of an AFI or international critic poll minus the pretension, I wonder how Good Morning, Miss Dove! came out. I'd propose high. There was time when most people I mentioned this title to recognized it. Good Morning, Miss Dove! lured all ages for universal theme that was teaching, and memorable women who taught. Everybody it seemed, had known at least one Miss Dove. 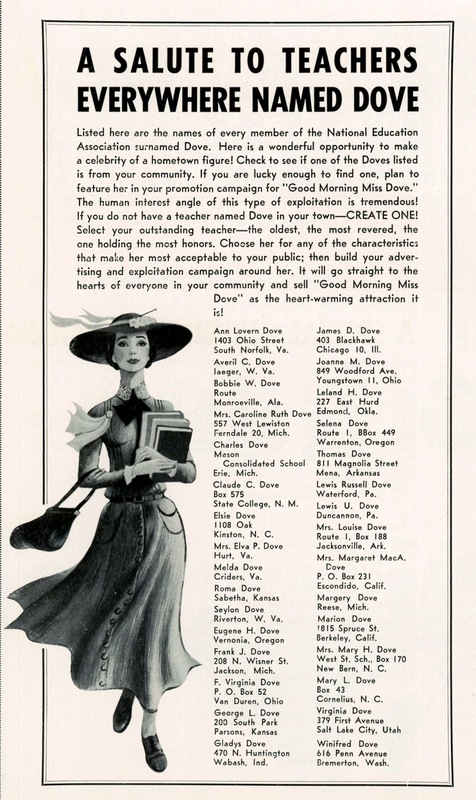 The notion of schoolmarms as for most part selfless spinsters was fortified here, and though some might call that profiling, what of fact we all encountered Miss Doves from primary right through highest education? Jennifer Jones did a character that everyone could identify as their own Miss Whatever, and it would be worthwhile to know how often the actress was approached with, "I had a teacher just like Miss Dove." 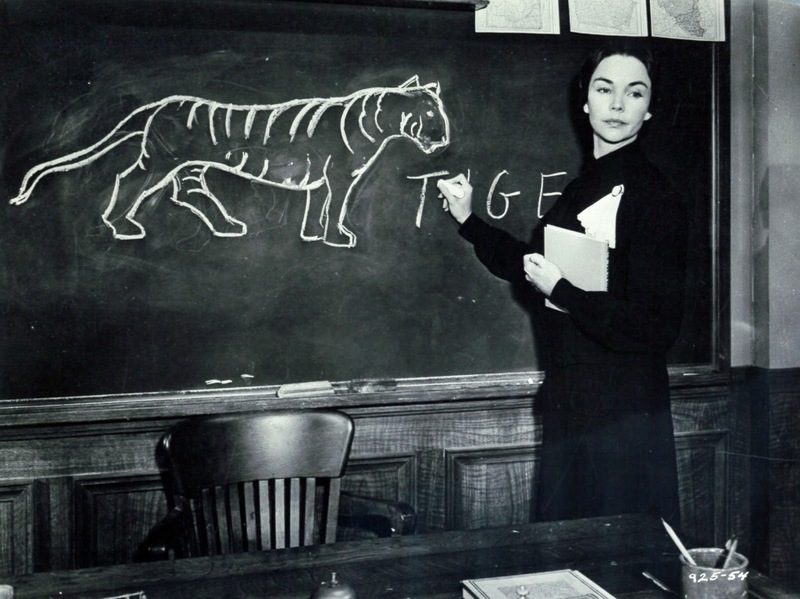 For me, there were several, one in her "teacher house" just across my street, others stood before blackboards for one after other generations, town folk assigning legends to women who claimed little life beyond that with pupils, and parents who occasionally poked noses into life of the school. We'd all wonder how these teachers came to be alone. It was vital that each have a backstory, however fictional. Common explanation was a doomed romance back in the war, an only man she could ever love who died in combat. We were sometimes told by parents how beautiful our teacher had been once upon a time. This conferred humanity on otherwise stern and unbending figures of authority. Good Morning, Miss Dove! gives us the pretty and eligible girl ossified by years of routine and obligation. Seeing NBC's 10-28-63 primetime broadcast of the film helped me understand better a second grade teacher to whom I could now assign a complex past that made her less the ogre she seemed. Maybe it wasn't a tragic affair from the war that sealed Miss Finley's fate. She seemed way too old for that, unless it was loss sustained during the Crimean War. 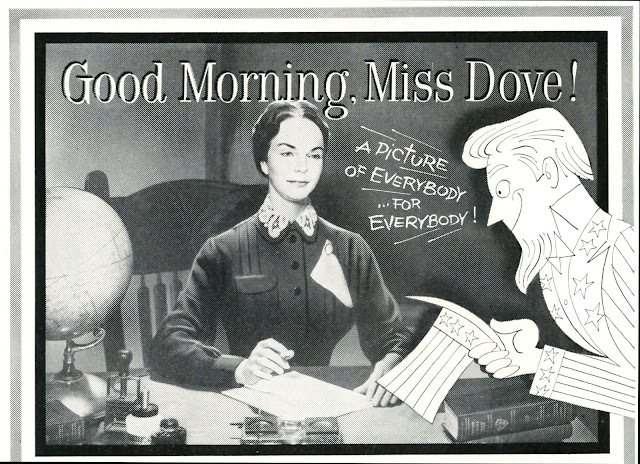 To shorten the point, Good Morning, Miss Dove! really spoke to me, as I suspect it did to legions of others. "Did" is operative word because with schools so changed as now, Good Morning, Miss Dove! would seem antique as something laid in ancient Egypt. The picture rang my bell because our school ran exactly like the one where Miss Dove taught, in a town very much of a piece with the movie's own background. Good Morning, Miss Dove! and increasingly fewer like it were seeing out small town-set Americana. The show did well because there was still enough of an audience to whom it could mean something. Soon-to-come Peyton Place, published the year after Good Morning, Miss Dove! 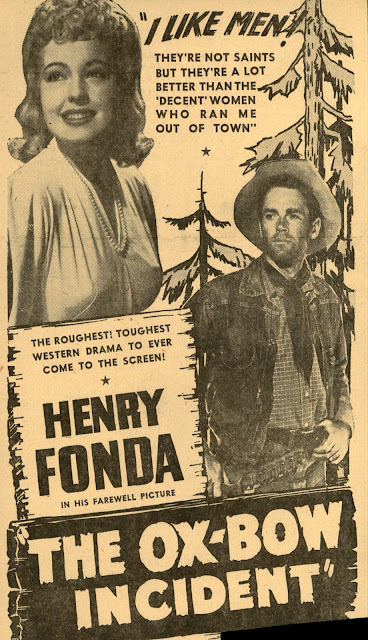 was released, would strip Americana of sentiment, Fox further blowing taps with their 1957 movie adaptation. Public education changed too, many said for the worse. Miss Dove would serve as longing look back for folks undone by onrush of anything but progress as they saw it. Hollywood serviced that mindset, but on much more limited basis as international markets became critical to break-even. There was Pollyanna from Disney, Papa's Delicate Condition, The Ghost and Mr. Chicken, Follow Me Boys (again Disney), others that looked to celebrate neighborly times past, most period set because how could they be believed otherwise by the 60's? I watched Good Morning, Miss Dove! this week on TCM after waiting forever for it to turn up somewhere in scope. Their ratio was correct, but the broadcast wasn't HD, which raises query as to whether Fox has a higher-def transfer on hand. There is a DVD, but it is 4:3 letterbox and that's no way to fly. FXM has not run Good Morning, Miss Dove! in some years, and no one to my knowledge streams it. 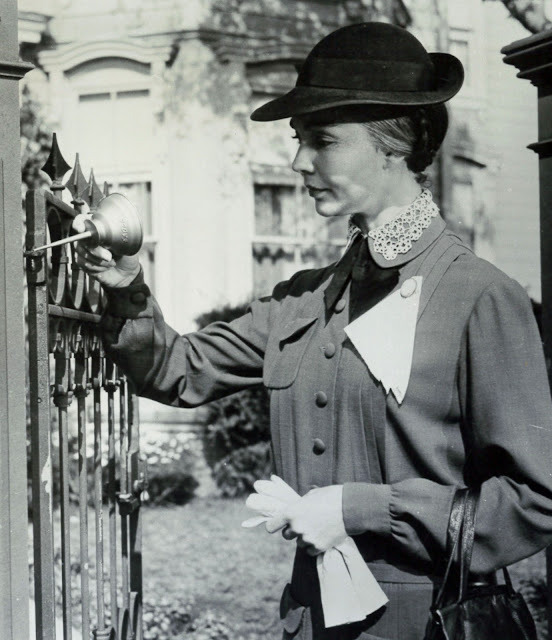 Good Morning, Miss Dove!, along with Cinemascoped Prince Of Players (also shown on TCM, also not HD), King Of The Khyber Rifles, The Revolt Of Mamie Stover (4:3 letterbox on TCM and FXM), plus further handful, each continue to elude us in proper presentation. 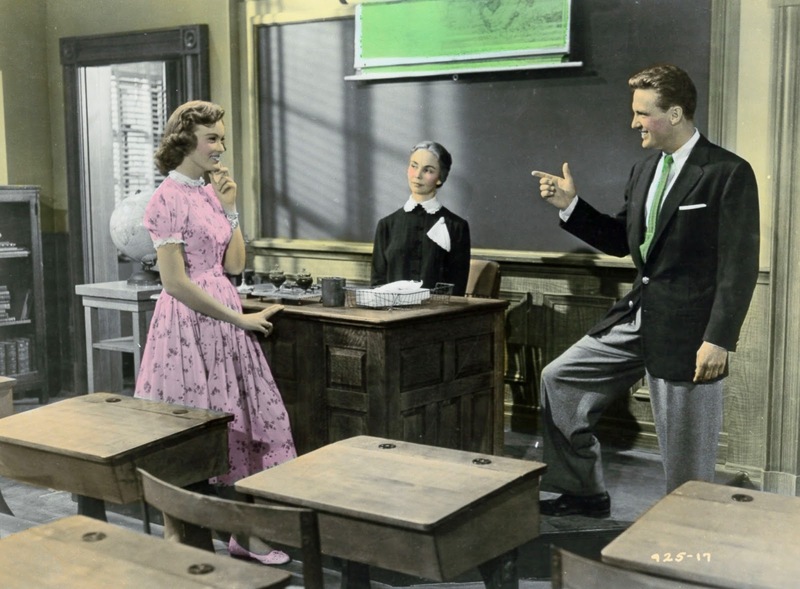 So far as the mass sees it, classic movies bear much a same onus as classic books. Too few are widely read or watched. I heard of a rich sponsor once who tried spreading great music country wide. He figured just hearing Beethoven, Debussy, the rest, would make converts of us all. After ten years, his project chucked, the would-be spreader of culture acknowledged that classics were for an elite after all. Irony is that all art was once brand new and (mostly) popular, at least to first receiver eyes and ears. People think of classic novels as something they were compelled to read in school, Never Again forsworn as doors swing behind graduation. 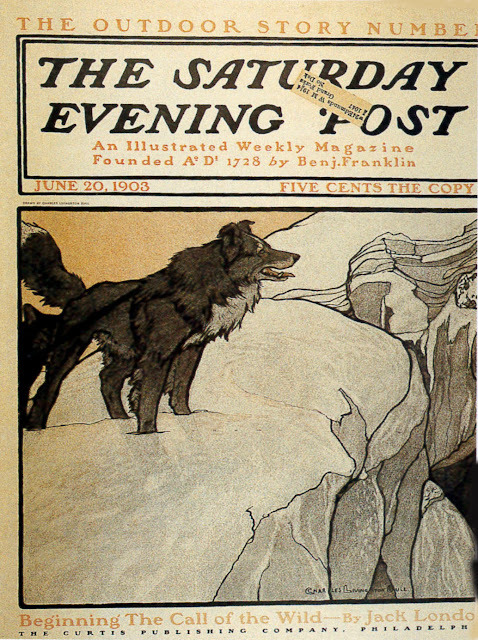 I got out a so-called Great Book last week, Jack London's The Call Of The Wild, published in 1903, serialized in The Saturday Evening Post earlier that same year, and never out of print since. Were Post readers force-fed those chapters from week to week? From what I understand, they'd wait on tenterhooks for each installment. 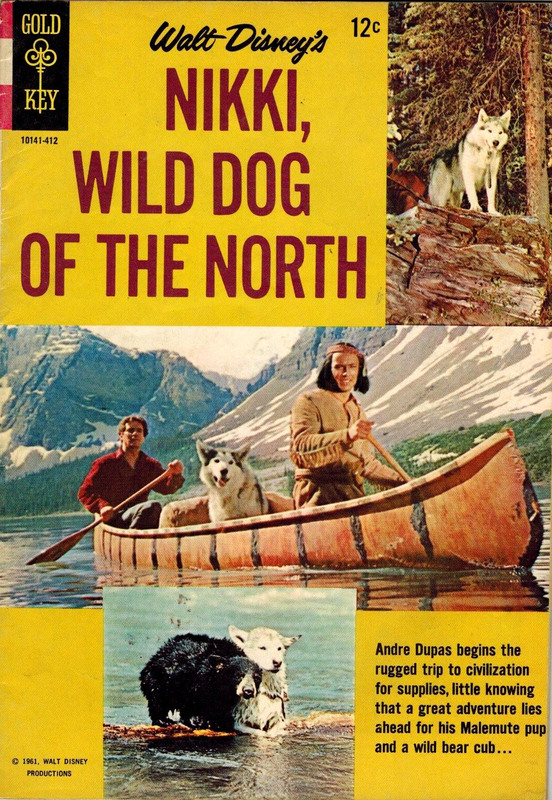 For me, The Call Of The Wild was a corking good yarn, not work at all to read, and went by fast. It has dogs, violence, gold seeking, and dogs. I don't know how the writing could come at faster clip, or be more engaging. Additional kick in first editions was cover, and throughout, art by Philip R. Goodwin, dean of outdoor illustrators (sample at right). 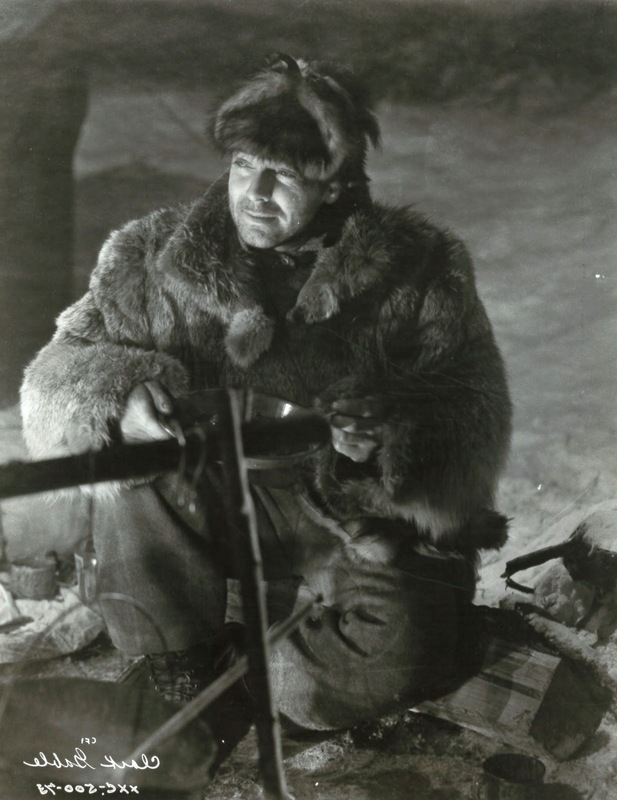 Only trouble with Jack London's story is that you couldn't practically translate it to film. 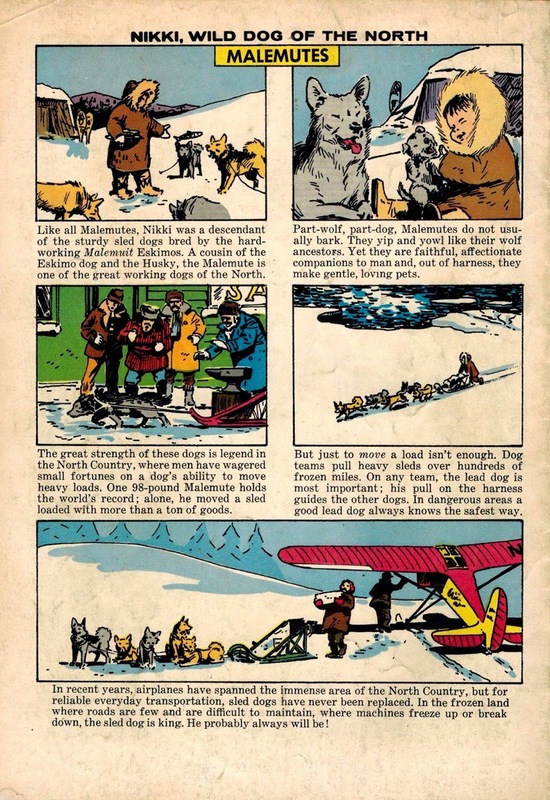 Buck the St. Bernard-Scotch shepherd is kidnapped and put to sled-pulling in the Klondike. He reasons and schemes like a human. How's getting that over in a feature film without narration or dogs given speech? 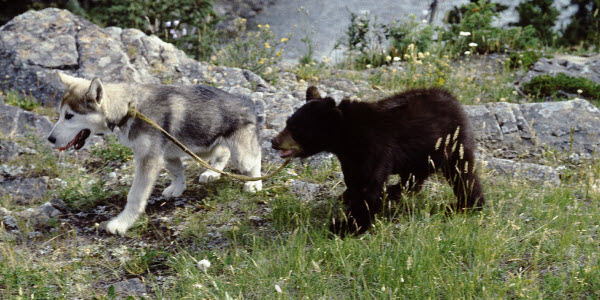 Rin-Tin-Tin managed it, with assist of titles throughout to guide our way. By such means, he could "talk" and still be credible. Lots of wonder dogs prospered during the silent era. Sound and chat hobbled their act, except as support to humans. 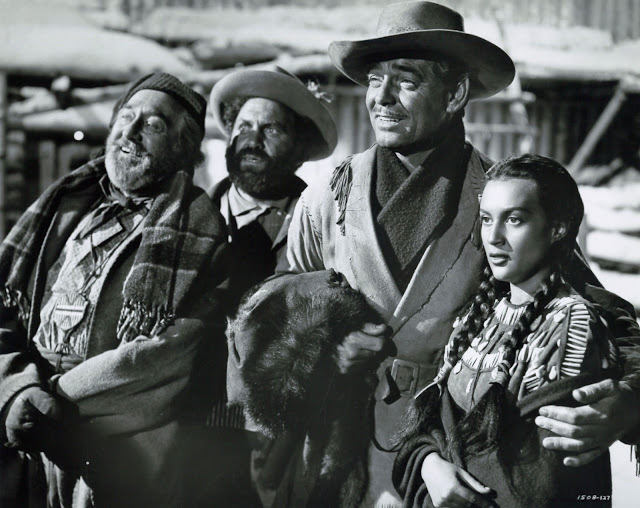 Dialogue was largely why Buck got demoted for Twentieth-Century's 1935 adapt of The Call Of The Wild, also practical necessity of stars to make attractive a story everyone knew by name, if not content. "Jack London's Call Of The Wild," or as credits read, "Based On The Story by Jack London," lent heft to make this more than Hollywood dream-up of life in snowy raw. 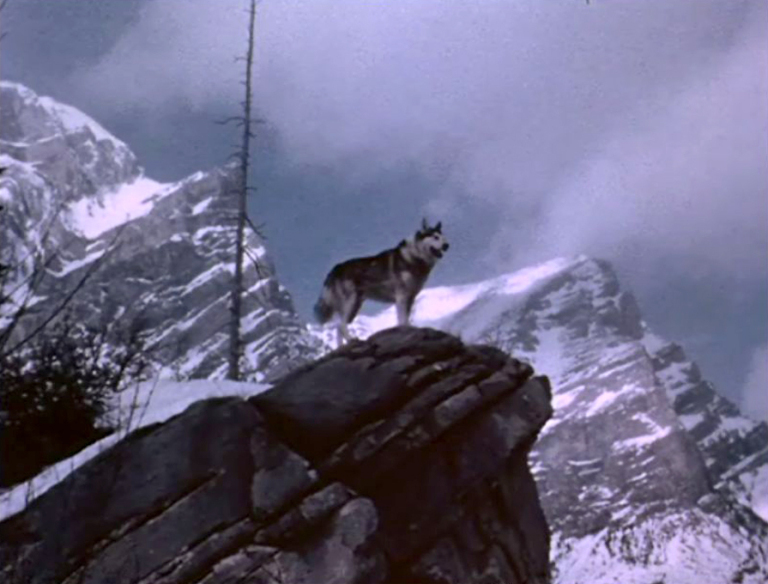 So long as movies had to distort source novels, I don't know how they could do it better than 1935's Call Of The Wild. Enough spirit of the London story is here to make us know it is his inspiration that will drive action. 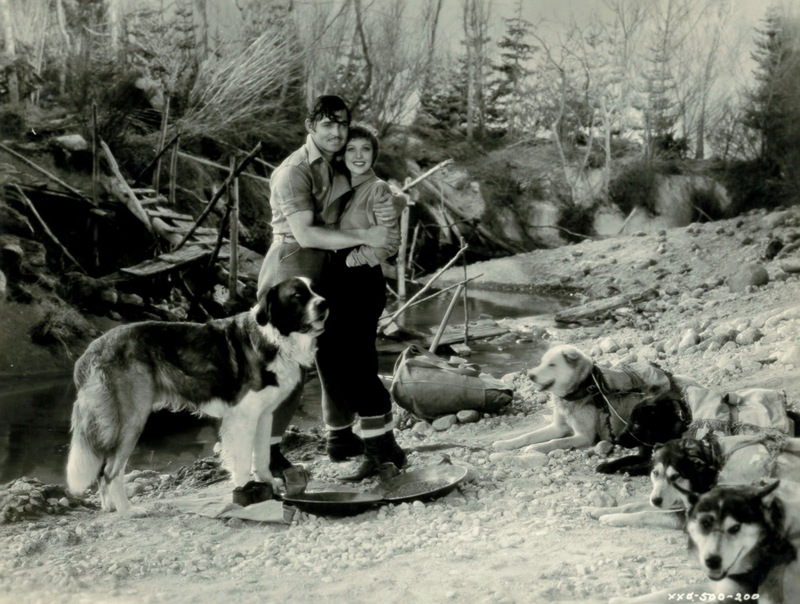 Buck the dog is subsidiary to Gable and lead lady Loretta Young, but much of narrative turns on what Buck will do, including a most memorable portion of book and film, where he pulls a thousand pound sled. Answering the title Call takes Buck away from human company, then back, till an honest end, consistent with London, sends him permanent to woods and company of wolves. Call Of The Wild was made largely on location, first in Washington state, then closer to L.A. for outdoor work that was left. It is a better constructed job than most of what Hollywood did from literature. 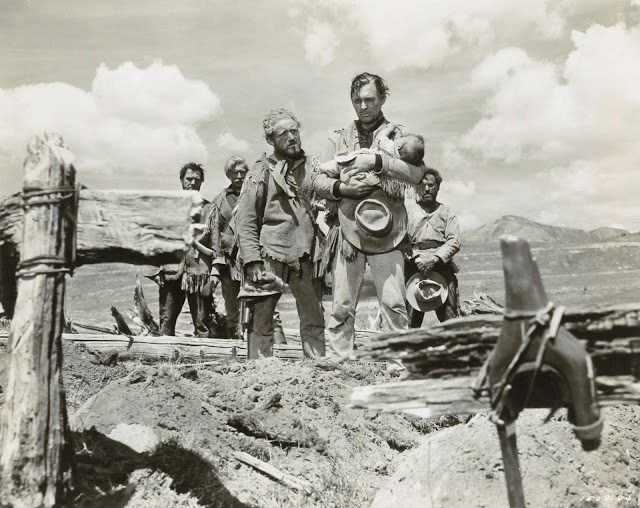 William Wellman as director lends usual energy and pace. I didn't feel cheated by compliance to the Code, greater enforcement in effect for six months before Call Of The Wild began shooting. Gable as "Jack Thornton" and married-to-another Young are clearly living together in their wilderness cabin, this after Gable has fallen out with, and discarded, mistress Katherine DeMille. To this extent, Call Of The Wild plays like a precode release, and is much the better for it. Call Of The Wild would wait to be adapted faithfully, but as things worked out, not as Call Of The Wild. 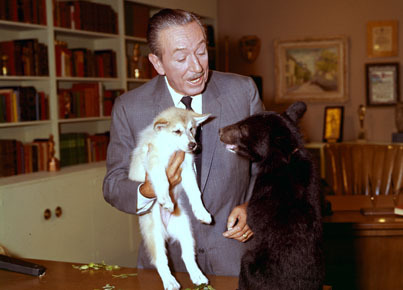 Walt Disney had worked up to all-animal features from successful "True-Life Adventures" that put a bead on nature and made these thirty minute extras a highlight of 50's programs. Disney acted on conviction that wildlife could anchor a matinee or evening's entertainment, and so began a cycle of well-received features with four feet in the lead, 1957's Perri a "Fabulous First" to gamble against humans as rooting interest. True-Life featurettes had proven this could be done, and besides, at just 75 minutes, Perri could be propped by other of Disney output to fill out a show. Dogs had been most vital aspect of memorable Old Yeller, but that was as much a human drama, and not so dramatic a departure from boy-dog stories well-received before. Lassie had gone on long treks for MGM, but made and kept human contact during each. Disney would depart from movie norm by letting his Nikki, The Wild Dog Of The North go it alone for most of that 1961 film's 75 minute run-time, the dog interacting with other animals he hunts, or that prey on him. Narration supplies the context, explanation here and there of what's happening, though little of that is needed. 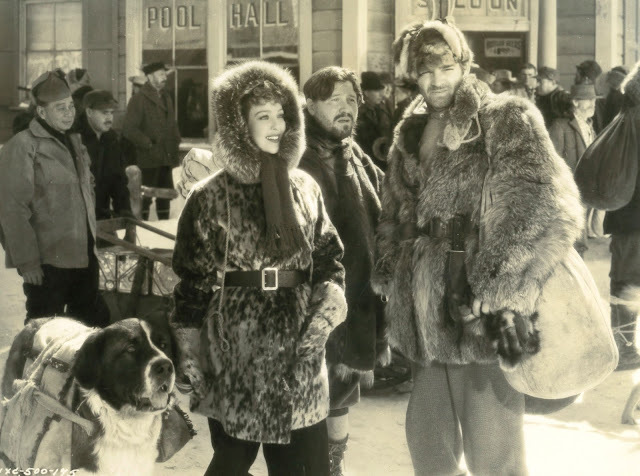 Derived from a novel by James Oliver Curwood, so say credits, Nikki is actually truer to spirit of Jack London than other films up to that point. Disney made us embrace animals as central interest and like it. Nikki and its kind were in their way as revolutionary as full-length animation Walt had introduced back in 1937 with Snow White. Nikki gets lost in Canada wilds and reverts to savage nature. 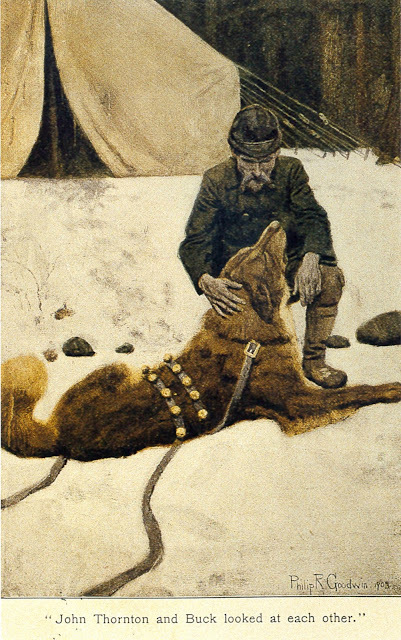 Can he go back to being man's best friend? There is rugged animal action to belie expectation from family-geared Disney. Nikki fights for life, and meat sustenance, on less sugar-coat terms than we'd expect. Act three suspense turns of whether he'll be rescued from a dog fighting arena to which he's tossed. 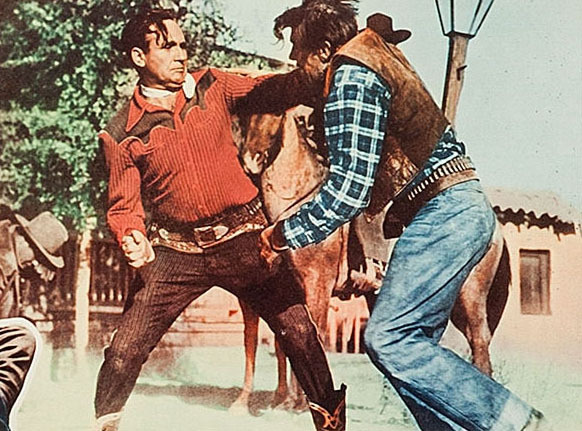 Dog fights on screen, real or faked, are a touchy theme today, but Disney stages melee like blood sport it is, and we liked such raw meat fed us in 1961. My own Nikki, a stray found days after I Liberty-saw Nikki, The Wild Dog Of The North, had come in from her own wilderness laden with ticks and expectant of pups (she had five within weeks of adoption). I'd cherish Nikki for five years, until she was lost to wheels of a passing car while I was downtown watching One Million Years B.C. (the reason I've been cold on B.C. since). 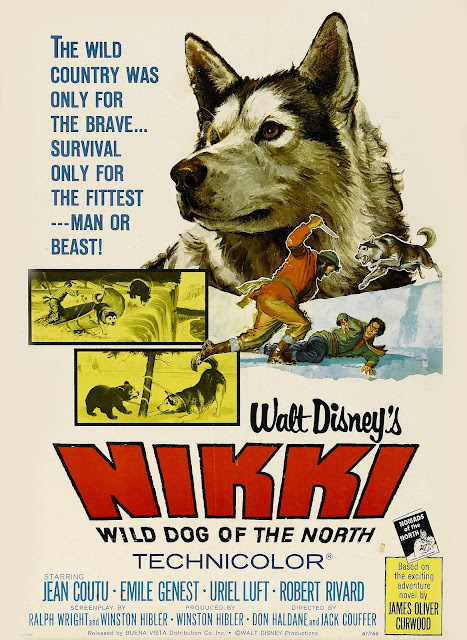 Nikki, The Wild Dog Of The North was obscure for years, but now streams in HD and widescreen at Amazon. My fondness for it is borne on wings of sentiment (what isn't where seen in childhood? ), but of Disney live action with nature as backdrop, I'll stack Nikki high if not snug at the top. 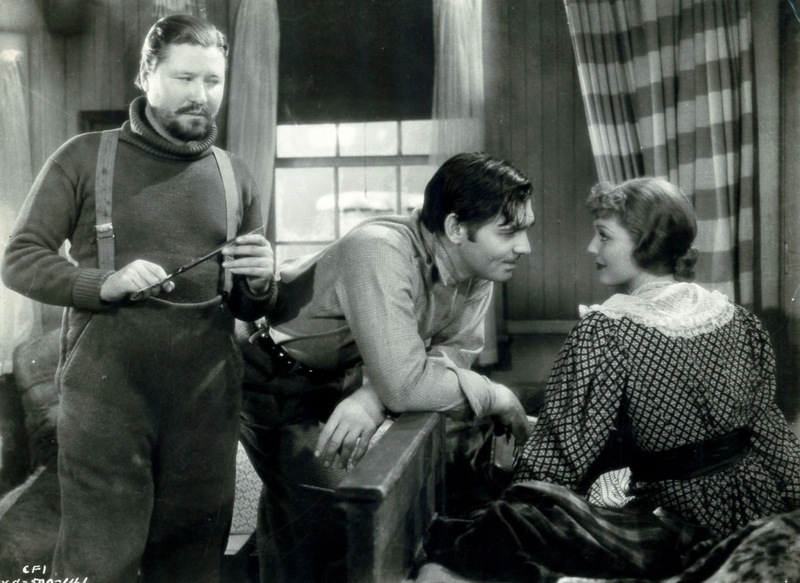 More of the 1935 Call Of The Wild at Greenbriar Archive HERE. Couple of recent conversations where James Stewart came up. 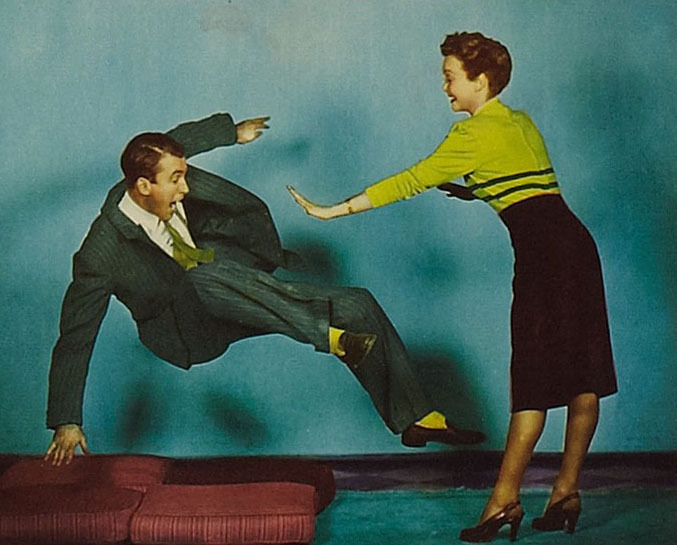 A woman I know, in her late 30's, said she and her boyfriend watched Rear Window, and then Vertigo, on TCM. 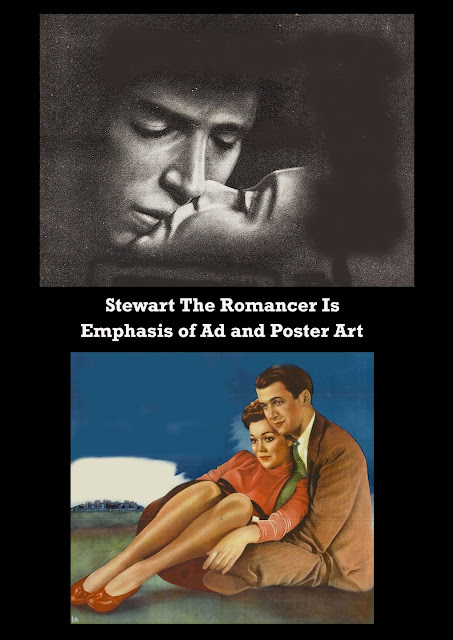 The movies were OK, she said, but Stewart's voice began to get on her nerves. First time I'd heard a comment like this, and it surprised me. Does Stewart grate upon modern ears? Someone else observed that his acting wouldn't be compatible to current films, or even ones made in a last forty years, which really gives pause. Makes me wonder then --- does Stewart's style belong to a past because performance technique is different, or because people are different from a sort he knew and dealt with? Stewart struck a fully congenial note with audiences for most of his run, a peak surely hit in the 50's, followed by slope through the 60/70's when we changed rather than him. It would be worth taking poll among those born during late decades, assuming they know or have seen Stewart at all. 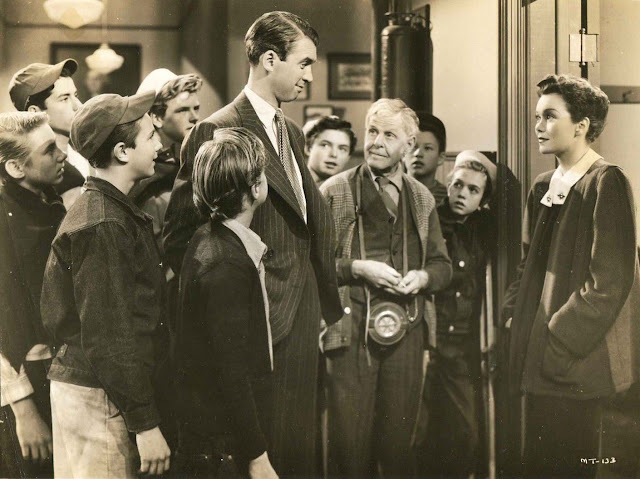 Outside of It's A Wonderful Life, I'm in doubt they would, or have. 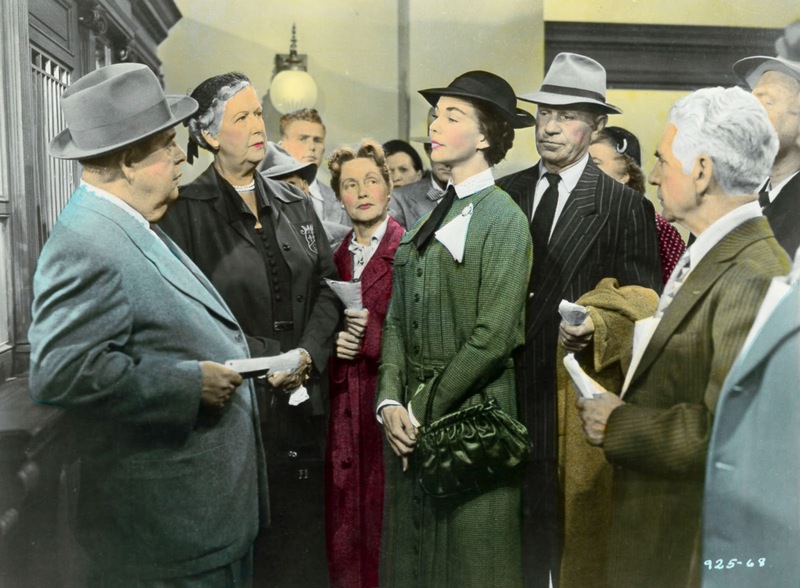 In event introduction were made, to one of the Hitchcocks or a western perhaps, how would young viewers react? We could apply the same question to other lead men of Stewart's era: Clark Gable, Tyrone Power, Gary Cooper. 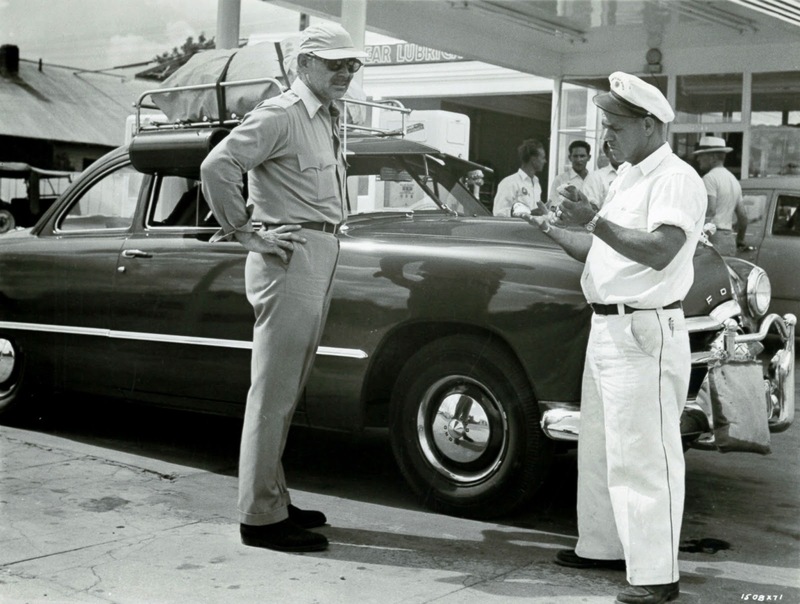 I take for granted that Bogart and Cary Grant still play to young eyes and ears, but do they? Have all old stars passed beyond gone, to foreign, to peculiar? I won't forget a time in 1979 when I saw Bright Leaf with a then-g.f. A scene with Cooper and Lauren Bacall made her squirm: This is just strange, she said. I knew it wasn't just the scene that bothered her, but the way these actors acted, and interacted. You can lead folks to old films, but you can't make them drink, this getting more so with each year that passes. For evermore relic title called out for insensitivity, as in wrong-then, wrong-now, we'll not be long before all of the canon is put into category better left alone. 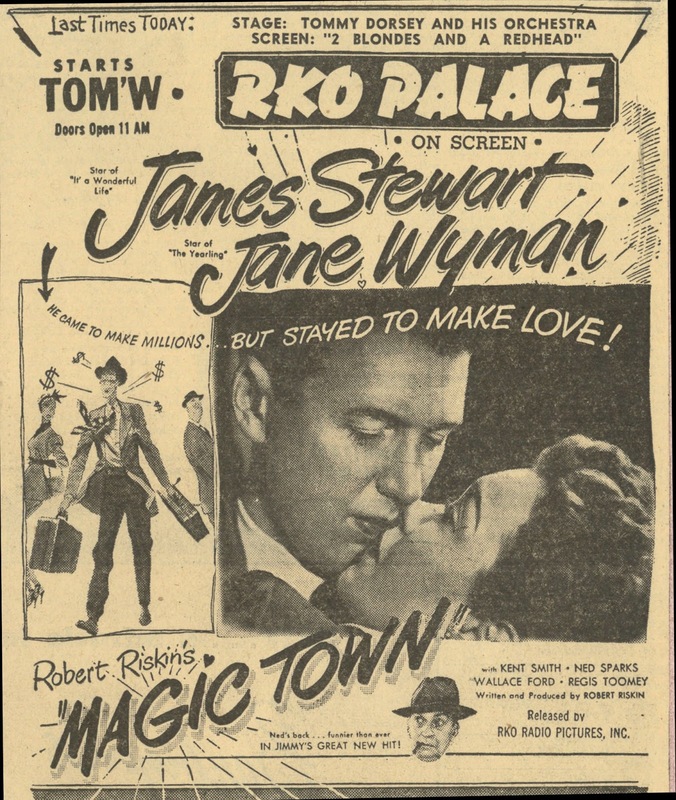 So much for dire fate of oldies and on to Magic Town, which had TCM "premiere" a short while back and was indeed event for having been gone from home screens a long while. I had not seen it at all, so was curious about this most Capra-like of films not directed by Capra. 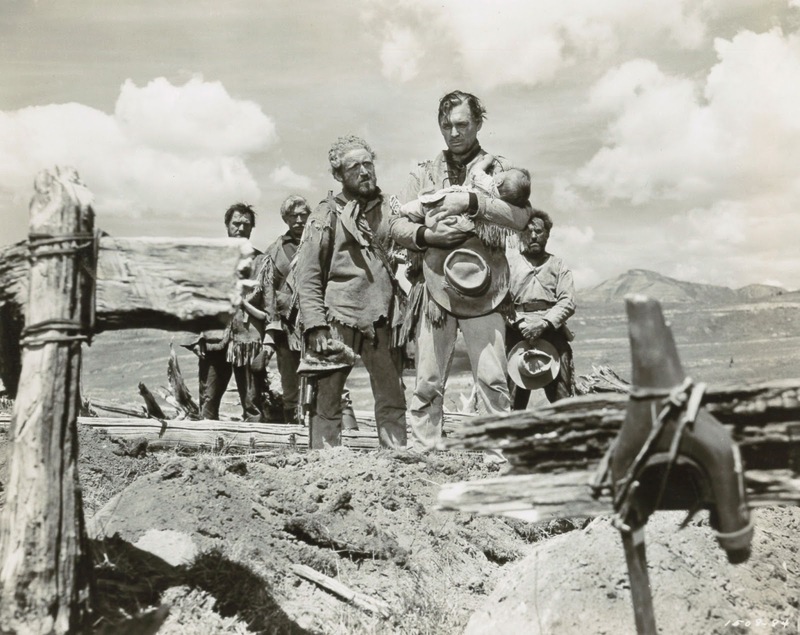 In fact, William Wellman stood helm. He later said it "stank;" in fact, challenged anyone to find anything good about it. I like Wellman a lot, but he must have been an exhausting old man to interview. "Wild Bill" would recall "throwing up" after seeing what studio meat-cutters did to Buffalo Bill, Lafayette Escadrille, whatever finished job he was unhappy with. He would speak of intent to put one mogul or other "in the hospital" should he encounter them on backlots. Wellman was honest enough to know where fault for flops was his. Said by the director to be done as "a favor," Wellman maintained that Frank Capra should have directed Magic Town. 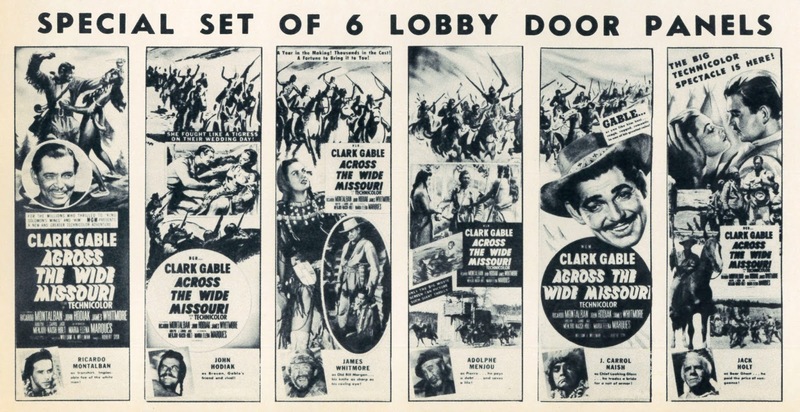 Pic was effort by writer Robert Riskin to break from Capra yolk and see one of his scripts through minus the Master's (and credit hogger) Touch. Riskin had a love/hate thing going with Capra. They wouldn't work together again after prewar successes, which were many. Riskin died early and young (1955, at age 58), and so left Capra, Wellman, widow Fay Wray, others, to tell the tale on Magic Town. 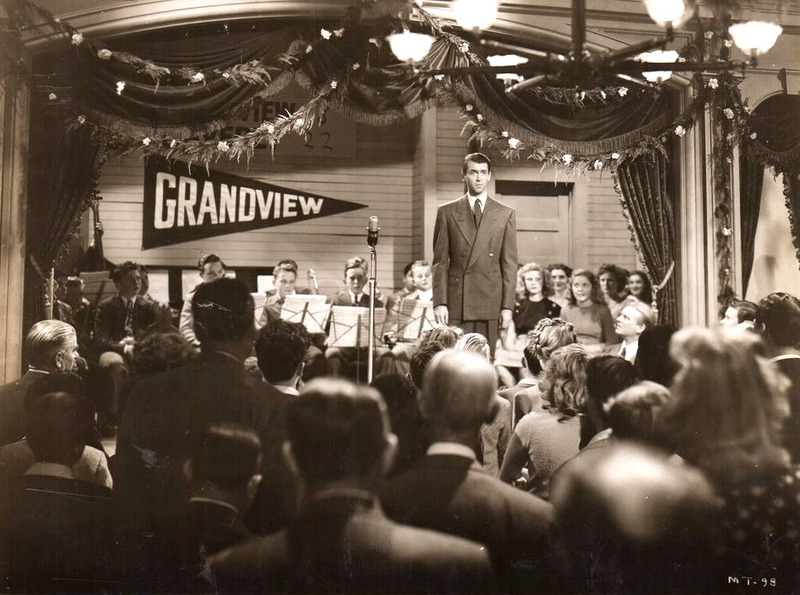 The movie is Capra repainted, its small town a Bedford Falls of but months after It's A Wonderful Life. You'd think people might embrace this as welcome encore for George Bailey in bucolic circumstance, but Magic Town has been forgot, or dismissed by few who've seen it. Stewart isn't noble or benign here, but an almost confidence man out to exploit rurals who represent an ideal cross-section of America, this to aid him in doing opinion surveys. 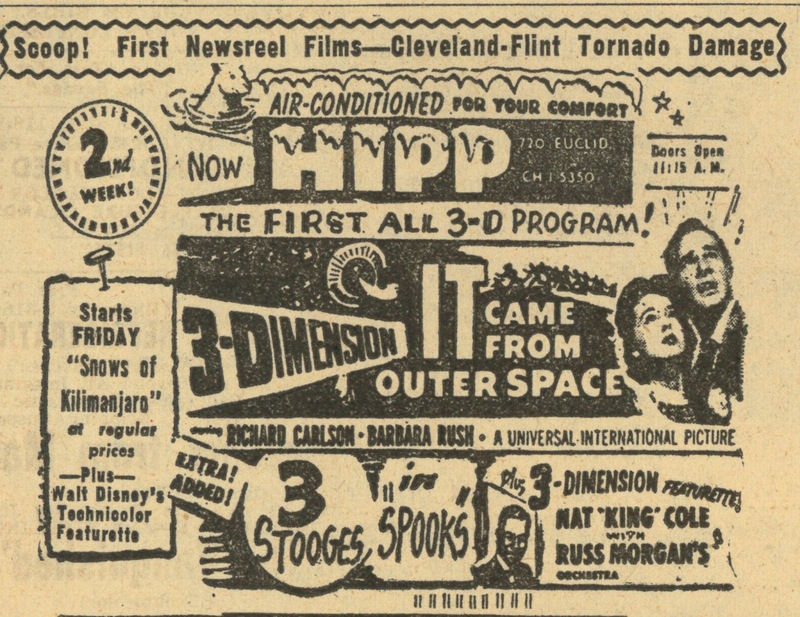 The concept was odd, even interesting, more so perhaps to 40's folk who knew or read much about Gallup polls that predicted what we'd buy, read, or yes, go to see at theatres. Selznick relied heavily on Gallup. You could argue for considerable credit to Gallup for success of Duel In The Sun. 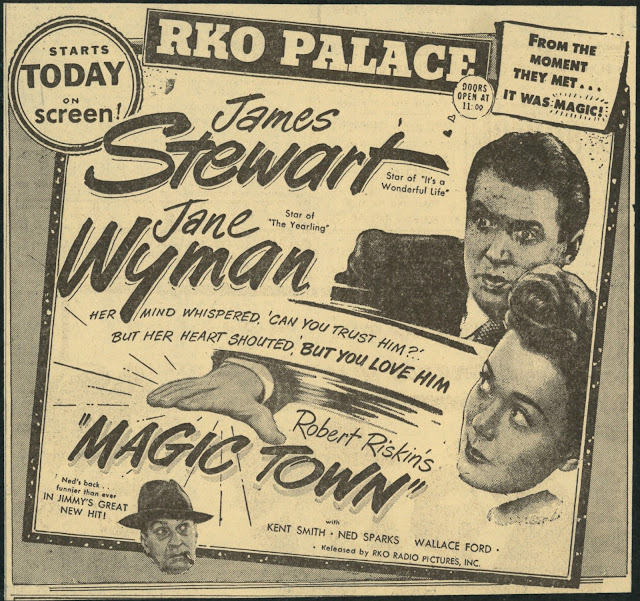 What Magic Town showed me was how darker shading was at play for most all of Stewart performing after WWII. 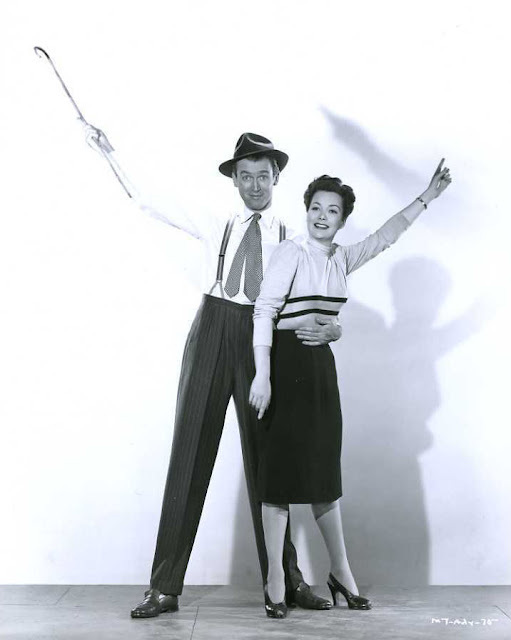 He is "Jimmy" here only in sense of third act reform and clinch with lead lady Jane Wyman. The switch Winchester '73 was credited for turning could be seen from several years off. I read how Stewart, back from service, looked at prewar Born To Dance (1936) and knew he could never go back to such a persona. Magic Town shows him applying lesson from that look-back. The most ambitious book ever on a Classic Era director is at hand. 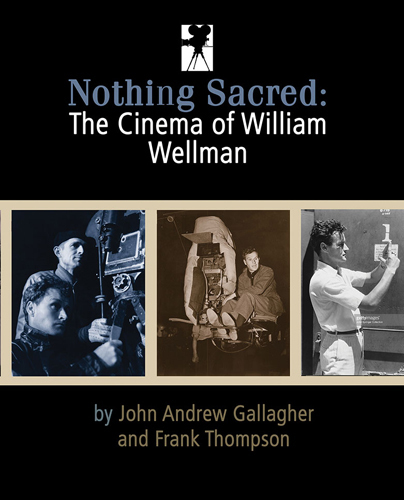 Nothing Sacred: The Cinema Of William Wellman, by John Andrew Gallagher and Frank Thompson, is available for pre-order from Men With Wings Press, a reading opportunity no film enthusiast should let fly by. I've seen portions of this book, and it is awesome. 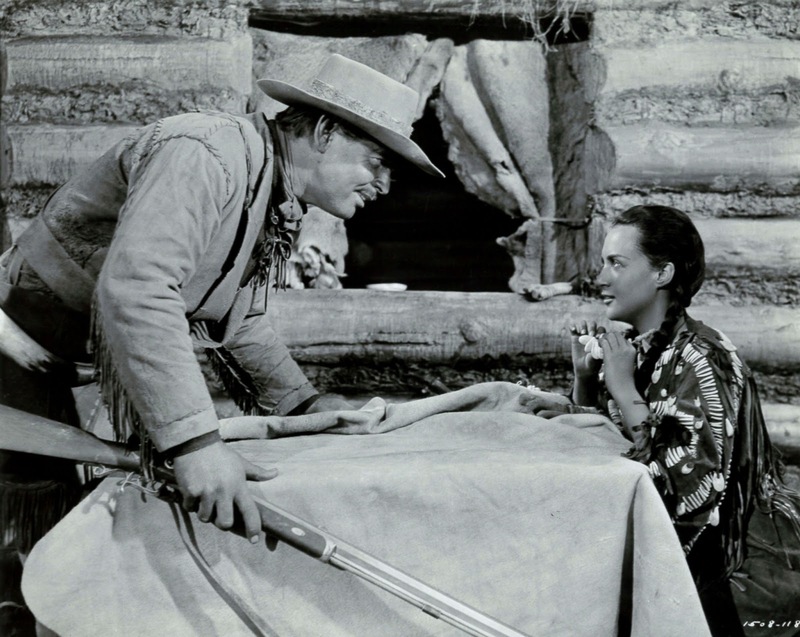 Gallagher and Thompson have gone deepest-ever into production of every feature Wellman was associated with, from silent apprenticeship to 50's finish. They have been over thirty years at gathering research and data. Text is based on hundreds of interviews plus probing into studio files. There are over a thousand illustrations, many from behind scenes and never published before. 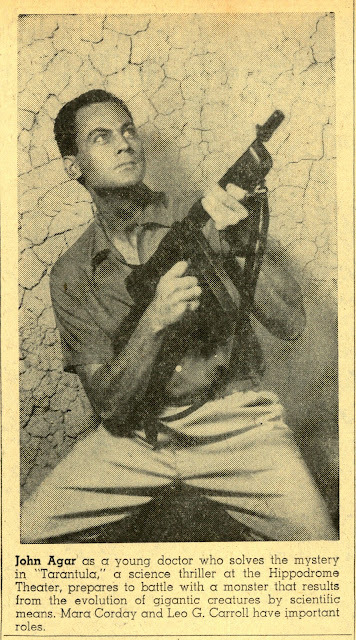 Pages are beautifully laid out, with one revelation after another on classics Wellman made, including, of course, Wings, Public Enemy, A Star Is Born, Beau Geste, so many others. The trophy case of outstanding Wellmans is full and bursting. 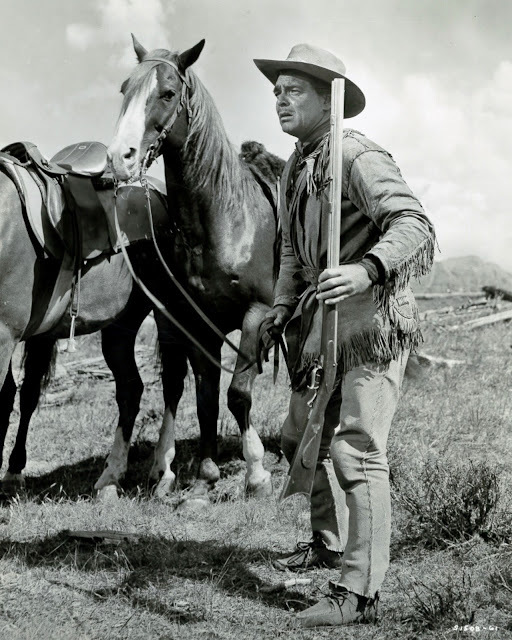 I can't wait to immerse in each chapter, so am starting engines this week by featuring three films of William Wellman here at Greenbriar. The book can be pre-ordered until December 1. There is not another coming this or any year that I would recommend higher. I've got a feeling that William Wellman and MGM writers went Missouri-way with noble intent to tell a truest story of mountain men who hunted beaver and paved way for frontier exploration to come. 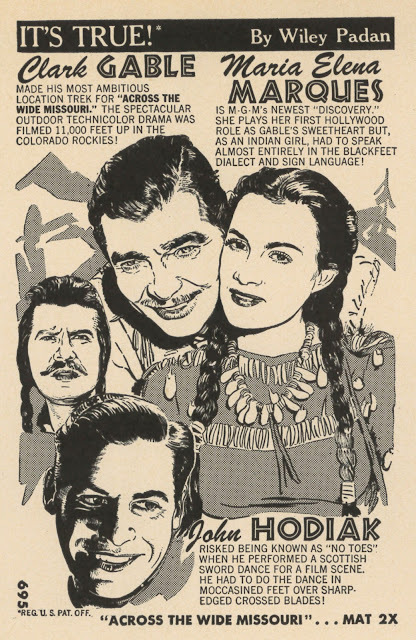 I well appreciate their disappointment over botch that Dore Schary and studio tremblers made of ambitious, if eccentric, work submitted after seven weeks running the Lion's clock at Technicolor'ed Rockies location. Yes, it cost high ($2.2 million), but not extravagant, and here's the thing, Across The Wide Missouri was a solid hit, reports of boffo and bouquets from boxoffices nationwide. Schary and staff were proved right, it seemed. They held Across in abeyance nearly a year, tinkering through that time with footage, narration added, David Raksin's score (more of latter anon). 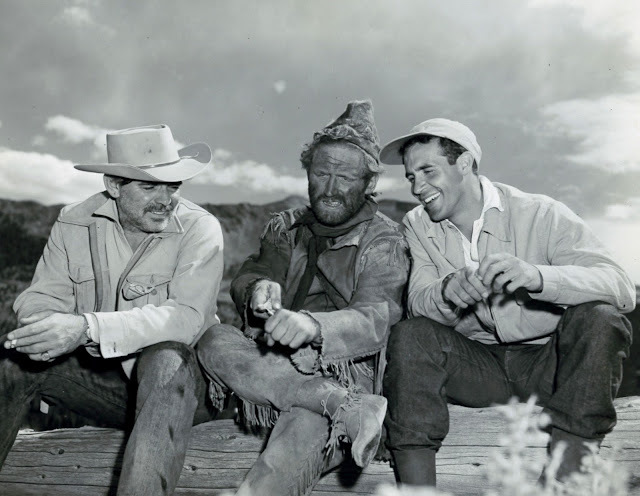 Meanwhile, Gable had done another western, Lone Star, and debate was whether to release it first. 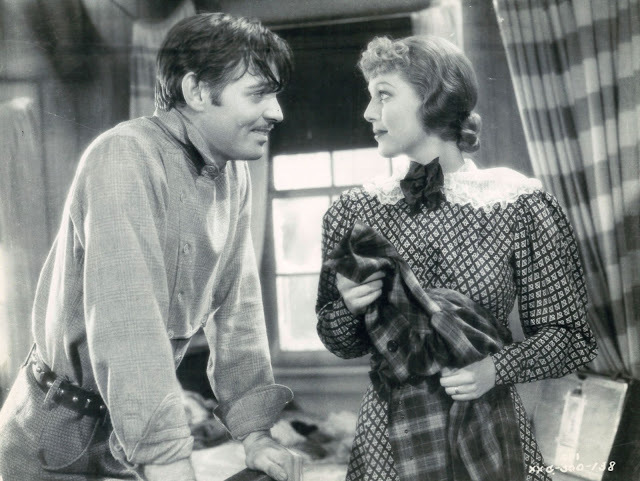 Hardly mattered, as both were clicko and forceful argue against myth that Clark Gable saw decline in latter days for MGM. Gable Drove Himself To Distant Location For Across The Wide Missouri. Here He Is Stopping For Gas. 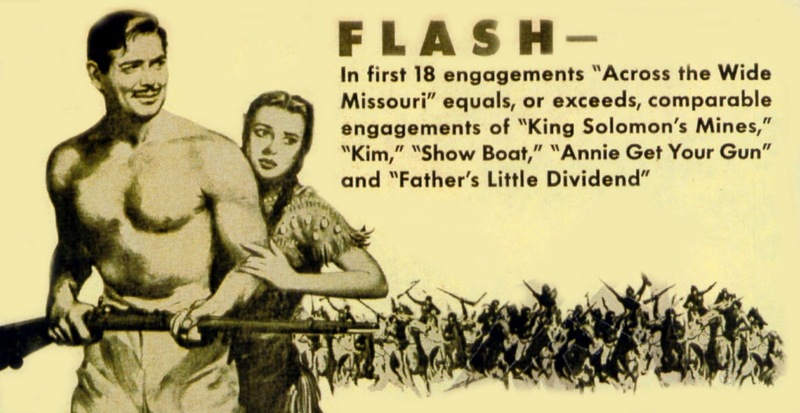 I watched Across The Wide Missouri again last week, a Warner Archive DVD that looked fine. Never saw it in true Tech, no print turning up during collector days despite years at quest. How simple is viewing with discs now at hand. Tip-off to Missouri mauling is players barely there in version we have, which is 78 minutes, but wait --- the 1951 pressbook indicates 81 minutes. 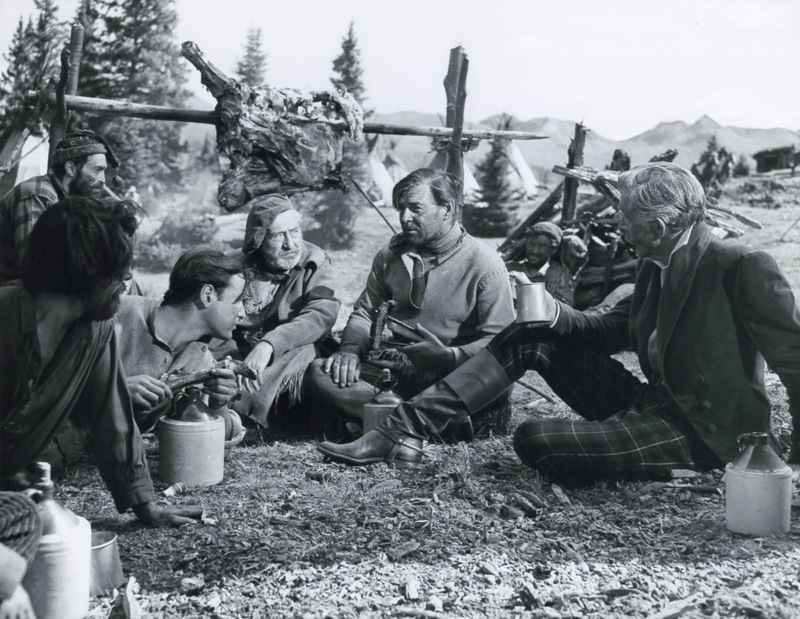 The cast had James Whitmore, John Hodiak, Richard Anderson, recognizable others. I've a feeling each had lots more to do before shearing started. Dore Schary candidly told an exhibitor conference (Variety reported) that Across The Wide Missouri would need work before it could be shown. The Red Badge Of Courage was his other problem child. 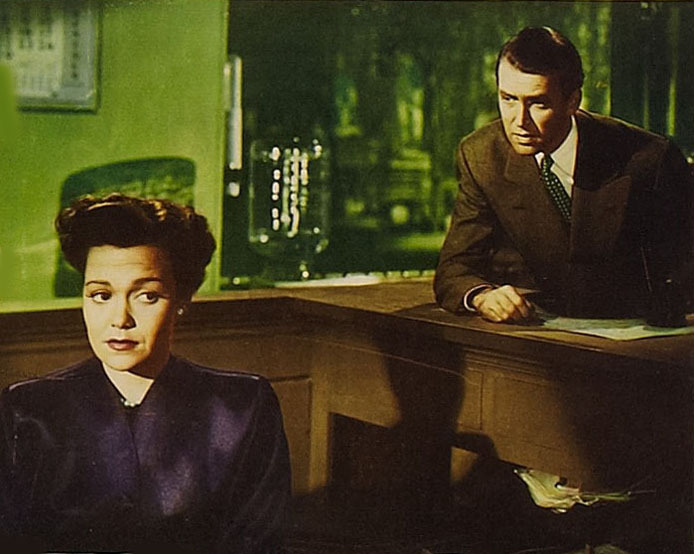 Strong directors having been involved (Wellman and Badge's John Huston), Schary was obliged to defend actions even unto memoirs he wrote in 1979. 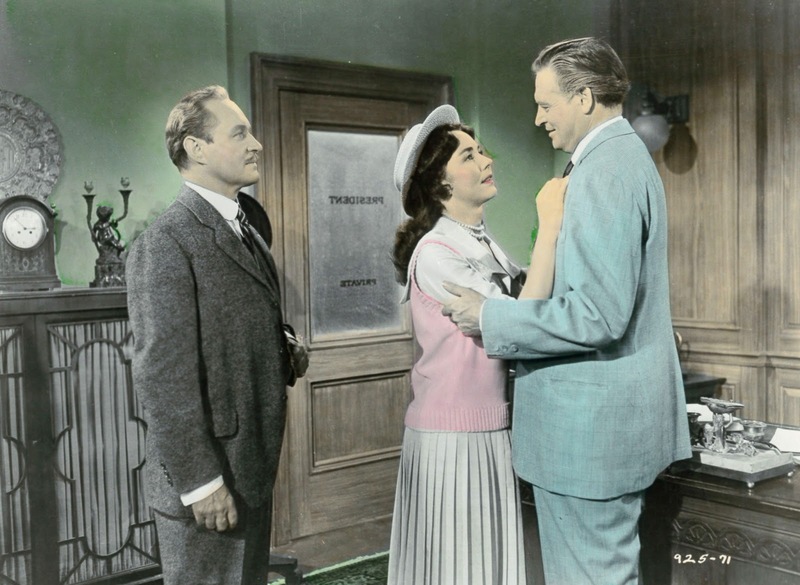 With regard Across The Wide Missouri that "sagged and stumbled," said Schary, he and surgical team applied magic to "our flagging picture," and " ...presto, the good movie popped out ..." Not so for Wellman, who disowned the film and claimed later to have never seen Schary's re-cut. 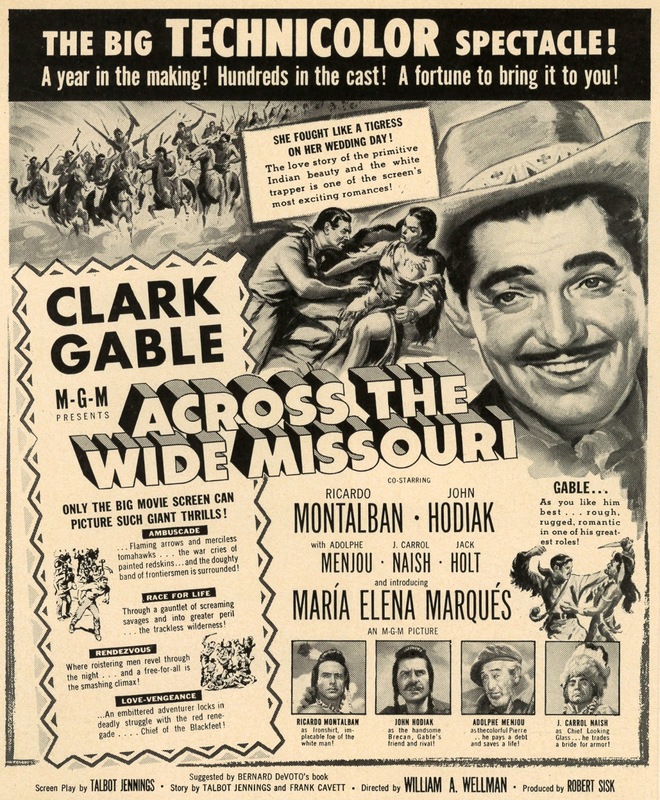 "When I first screened Across The Wide Missouri, in the long version, I was surprised at what a disappointing film it turned out to be --- in spite of Bill Wellman, Clark Gable, and the other talent involved. Some of the scenes with Gable were good, but the picture was overlong, and there was too much 'monkey business' involving the supporting players. I scored the long version, but then Metro panicked, the film was heavily edited, and my score was partially redone by another composer. In one sequence, my music was replaced by a watered-down version using my thematic material, at the instigation of the producer, a prize klutz who thought my version was 'too powerful' for the scene. I asked him whether he was aware of what such a remark revealed about his appraisal of the scene he photographed and edited, but he seemed not to understand what I meant. 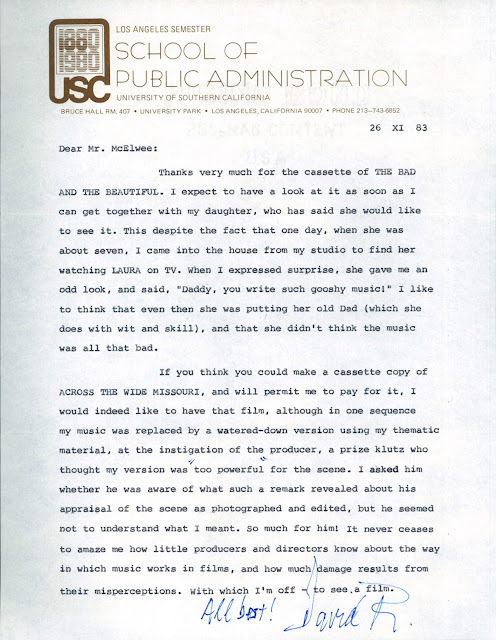 It never ceases to amaze me how little producers and directors know about the way in which music works in films, and how much damage results from their misperceptions. I was never happy with Metro anyway. Everyone meddled in everything. 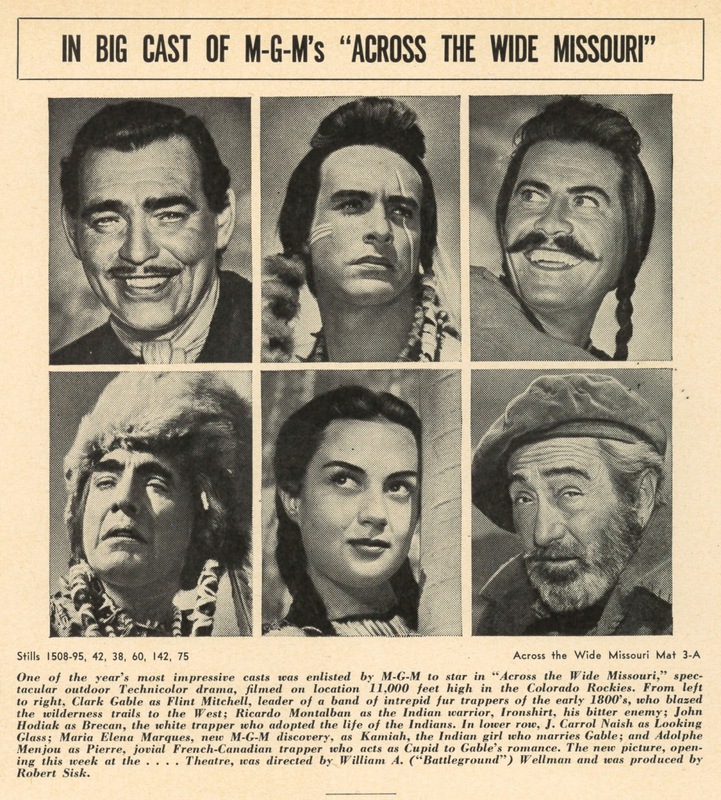 I can't honestly say that Across The Wide Missouri was any better a picture in its initial long version than in the 78-minute version that was finally released. 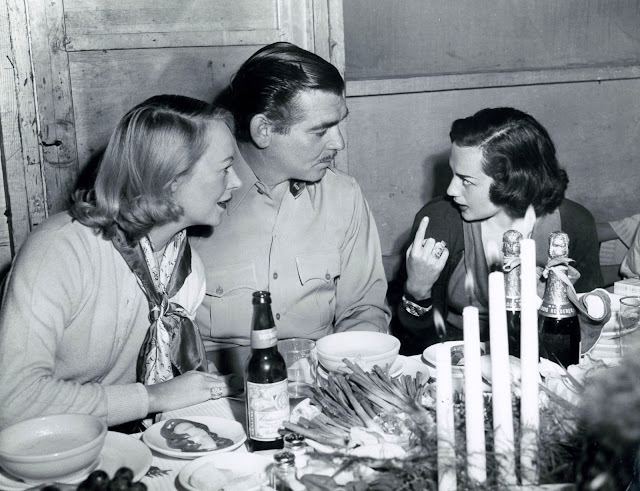 I always liked Gable and Wellman, but this was just not a good picture, at any length." I'm guessing that what Wellman delivered was an ensemble piece, all of a large support cast getting in licks at the narrative. These may have diminished strengths the story had, as in 'monkey business' Raksin saw as distraction. Were there already doubts before the preview was had? It's not like they could return to such a distant location and reshoot. Alarm in such circumstance is understandable. We could wonder how long Across The Wide Missouri was before they cut it. Two hours? --- more? 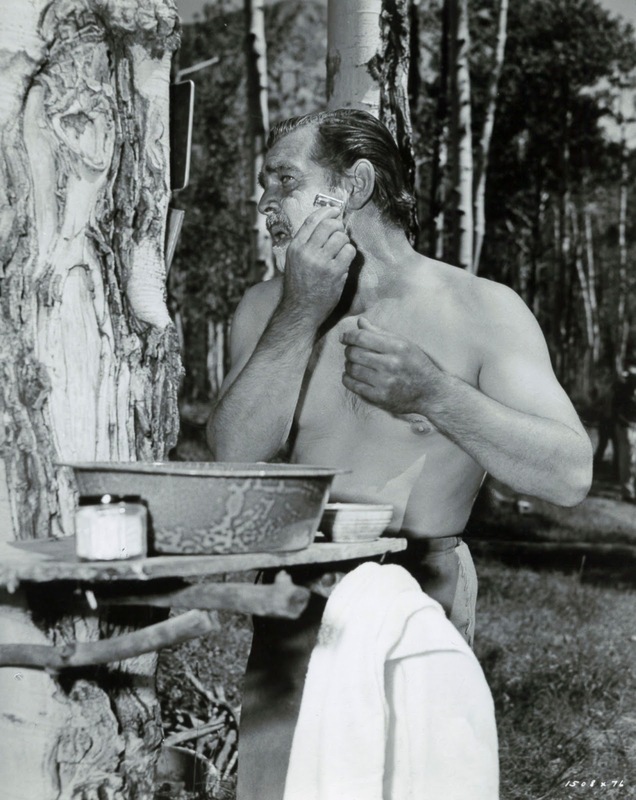 How did Clark Gable feel about ceding screen time to secondary characters? Did he suggest modifying Across The Wide Missouri to be more about him? That would certainly have been a star's prerogative, but Gable wasn't known for this sort of insistence. I'd say Wellman wanted a mosaic of personalities to show history as enacted by richly diverse participants. 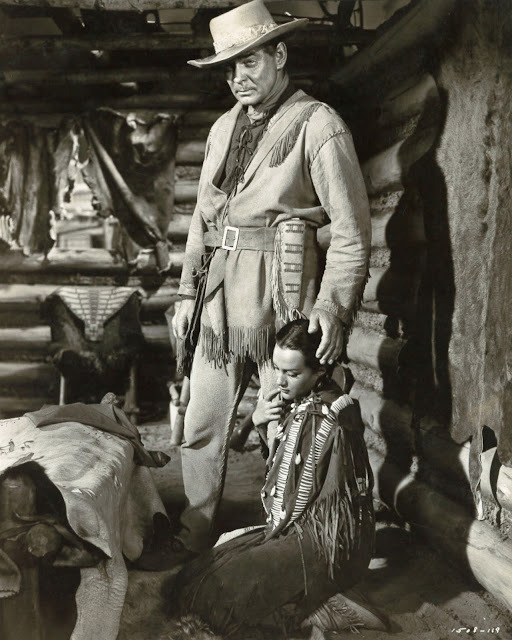 He was a student of America's past, like John Ford and other of great directors (Missouri co-writer Talbot Jennings was a recognized authority on Indian lore). Perhaps on-site enthusiasm got away from all involved, and the return home brought more baggage than anyone anticipated. 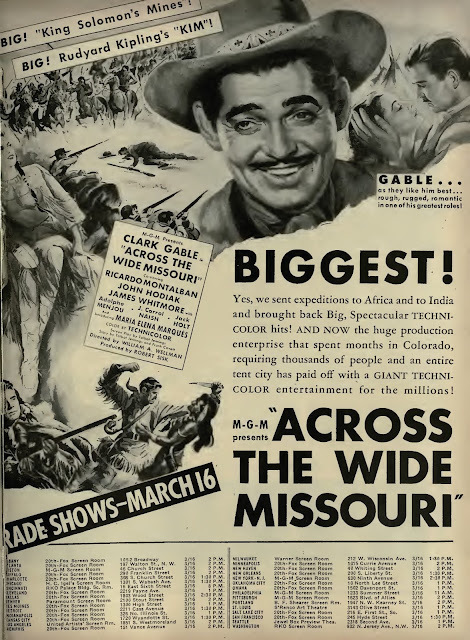 Across The Wide Missouri was based on a (same title) book that was well-received and popular, but fact-based rather than story driven. There was lots in its recitation of history to fire up artists inclined to recreate a colorful period, and surely the Rockies were heady atmosphere to bring pioneering to life again. Any talent might be as tempted to repaint a past, especially given Technicolor lenses and two million to capture glory of vistas. Across The Wide Missouri should be celebrated for its effort at capturing that era, and so stunningly as to visual beauty, whatever the running time. These 78 minutes aren't boring, especially if looked at on a big screen. Films Inc. had Across The Wide Missouri in their 16mm catalog. I wonder if they rented it much to schools. This would have made an ideal teaching supplement ... still would, for that matter. Too many discount Hollywood for distortions of history, too many, that is, who don't realize how valuable films like Across The Wide Missouri are toward recreating that history. Fall 1951 saw Across The Wide Missouri sold as comparable with biggest of Metro specials from a previous year, King Solomon's Mines and Kim both ready to bow before location splendor achieved by Wellman and company. Those were far off shot, but this was America the Techni-beautiful, and ruggedly actionful besides. Litanies of "Boff" and "Sock" rang off wicket reportage from keys. Missouri too was a biggest gross for Gable since Homecoming in 1948. Insiders and trade followers knew there'd been overhaul, but who cared so long as coin flowed? There was one exhibitor I found who did lodge complaint, however, one Dale Lee of the Wilma Theatre in Coeur d'Alene, Idaho, hardly a flagship for MGM at 600 seats, but Lee's inquiry in The Motion Picture Herald's 12-8-51 "What The Picture Did For Me" column surely drew notice. Following mention of "a great cast playing bit parts," Lee asked "If anyone knows why Metro got together a cast like the one in this Technicolor picture to go out on location with a director like William Wellman, and then, when they got it all put together, whacked it to pieces, I wish they would let me know ... it sounds like a lot of good entertainment wound up in the garbage. Our local newspaper critic is also trying to find out why they did this." Not a lot of "why" questions got answered by studios in the Classic Era, even waning days of it, so specifics behind re-shape of Across The Wide Missouri remain elusive. 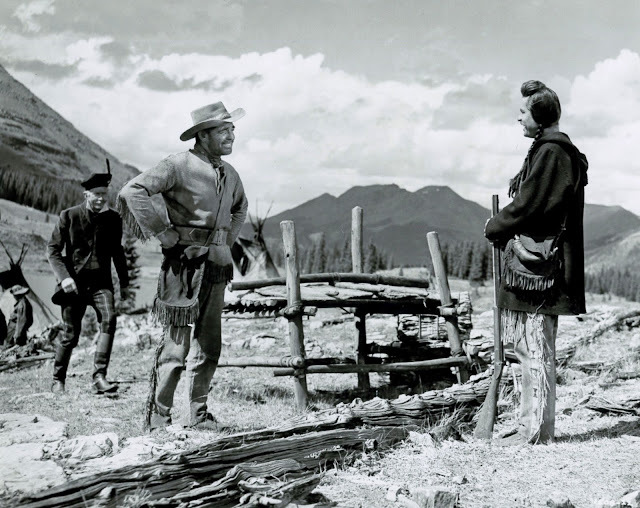 With sixty-six years now passed since 1951 release, I wonder how many, if any, are left who saw the film as William Wellman envisioned it.